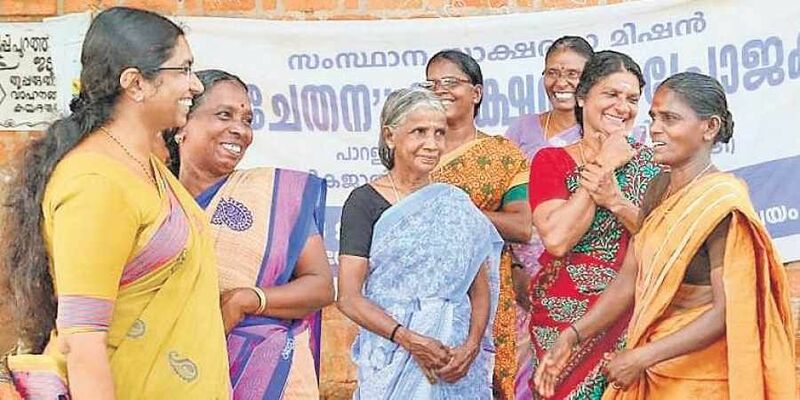 After working their fingers to the bone, most of the MNREGS workers from Gandhi Nagar Colony at Paralam panchayat in Thrissur are in a hurry to reach home before sunset. KOZHIKODE: After working their fingers to the bone, most of the MNREGS workers from Gandhi Nagar Colony at Paralam panchayat in Thrissur are in a hurry to reach home before sunset. Sixty-three-year-old Sharada is also in a hurry. Her destination is not home but the ‘Navachethana’ literacy classroom. Sharada, along with 10 other ‘students’ reach the classroom, happily wielding slates and pencils. For the next few hours, it’s a grapple with alphabets and digits, helped by instructor Hima Mahesh, who also hails from the same colony. “For me, mastering arithmetic is the priority. Being weak in counting, I’ve been duped many times by shopkeepers and autorickshaw drivers. But not anymore,” says Sharada with confidence writ large over her wrinkled face. The Navachethana literacy programme was launched in March in 100 select Scheduled Caste colonies. The aim of the project is to wipe out illiteracy from among the Dalit population in the state. The literacy exam for Sharada and 2,023 other ‘students’ is slated to be held on November 25 in 102 exam centres across the state. Of the 2,000-plus candidates, 1,618 are women. Literacy Mission director P S Sreekala visited Paralam panchayat to oversee the implementation of the project. She interacted with the beneficiaries who were too eager to crack the upcoming examination. “For some of those enrolled, Navachethana is a stepping stone towards their dream of eventually clearing various equivalency examinations. We will conduct Class IV and Class VII equivalency courses for those who clear the preliminary literacy examination,” Sreekala said. The beneficiaries of the ‘Navachethana’ programme were selected through a survey conducted by students, social workers and voluntary groups. To make the literacy programme more effective, instructors were also selected from among the Scheduled Castes.